One of the nation's biggest homebuilders is putting its top executive on notice after his vulgar rant against comedian Kathy Griffin went viral. KB Home CEO Jeffrey Mezger, who is a neighbor of Griffin's in California, was recorded by a security camera hurling slurs against Griffin while in a heated argument with her boyfriend. Mezger was angered after someone, possibly Griffin or her boyfriend, complained to police over a family get together at Mezger's house. There were apparently a number of complaints since the couple moved in next to Mezger's house. KB Home said in a regulatory filing Thursday that while Mezger has been "a great leader," his behavior was unacceptable and said that he would be fired for any similar incidents. It also cut his annual bonus by 25 percent. 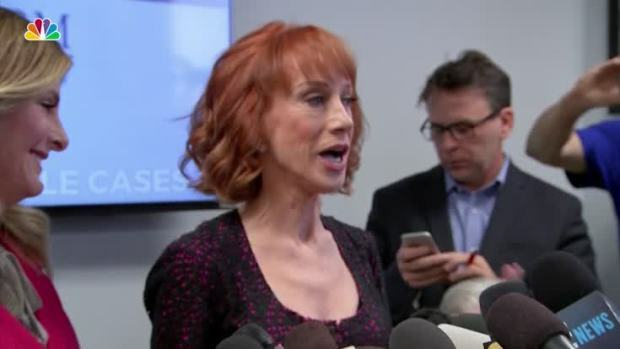 Comedian Kathy Griffin and her attorney Lisa Bloom discuss the fallout from the controversial image of Griffin posing with the likeness of President Trump's severed head.